The PRs With… window shows all production records that include your selected component from the Component Master window. On this screen, you are able to sort production records by order number, PR number, formula name, creation date, last modified date and the current production record status. Each of these headings can be clicked to adjust the sorting option that meets your current needs. Once you have selected your requested production record, you will have two options to choose from to continue, View PR or Show Holds. Each of these options will open a new window that provides more information on your selected production record. More information on these options and their functions can be found below. 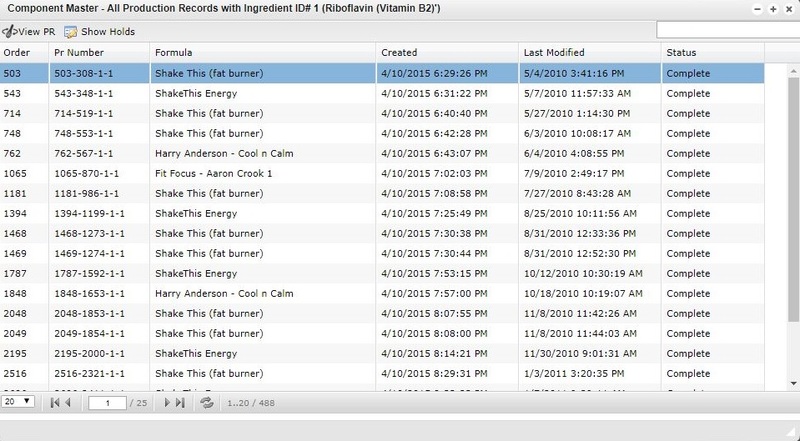 View PR – Clicking the View PR button will open the product record to provide any associated details, eta dates, special instructions, order notes, production record documents and all ingredients included in the formula. On this screen, you can also approve the production record then print relevant documents. Show Holds – Clicking the Show Holds button will open a new window that shows all orders that are on hold and contain your selected ingredient ID. From this screen, you have the ability to view specific orders, view order components and show all production records with an associated component.